These guys and gals aren’t all bad. StarCraft II: Heart of the Swarm comes out on March 12, and here's a look at the game's opening cinematic. Blizzard gave a sneak peek at a handful of new units currently raising hell in the development of the first expansion to StarCraft II as it closes in on beta. Tuning and balancing is a big part of creating a fun multiplayer experience, and Blizzard has been doing just that with Heart of the Swarm. 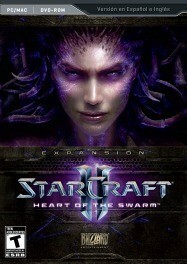 recent StarCraft II: Heart of the Swarm event. We finally have a sneak peek at what Kerrigan's adventure through the second act of the StarCraft II trilogy will look like.